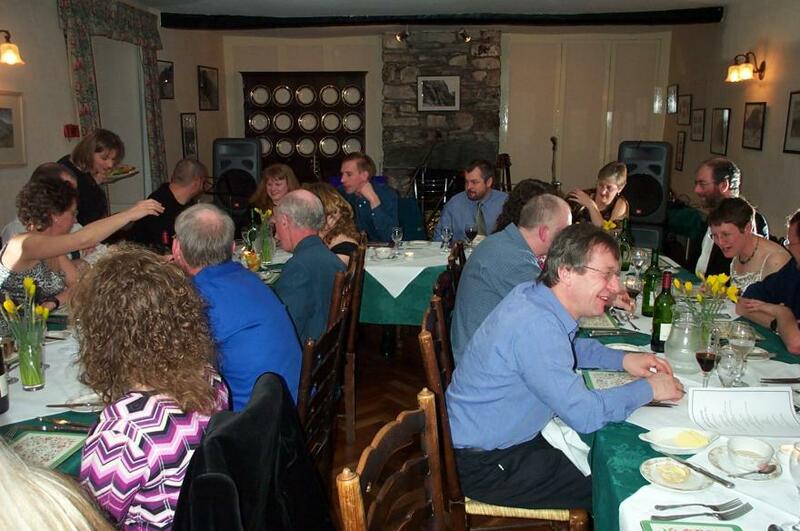 Last year's annual dinner at the Old Dungeon Ghyll proved so successful that many were keen to go again. 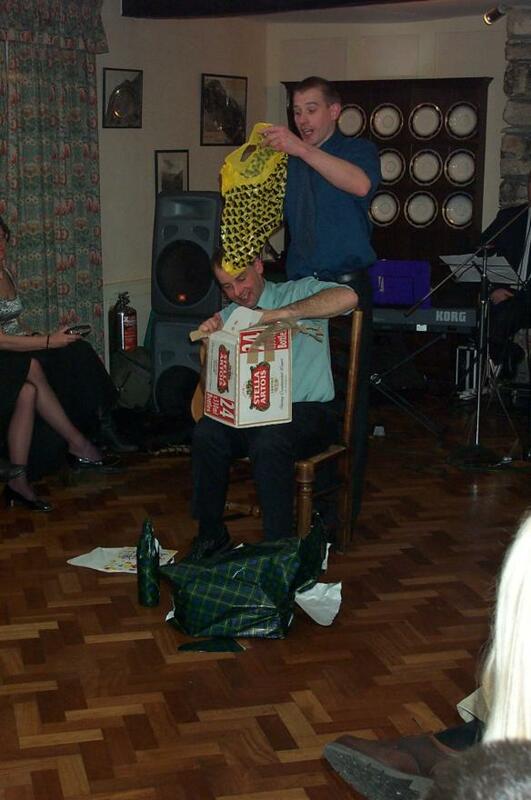 This year it coincided with Dave Wray's 40th birthday so he organised a grand dinner come birthday party. Anne and I wanted to do something away from Langdale in case we ended up doing it on Sunday. 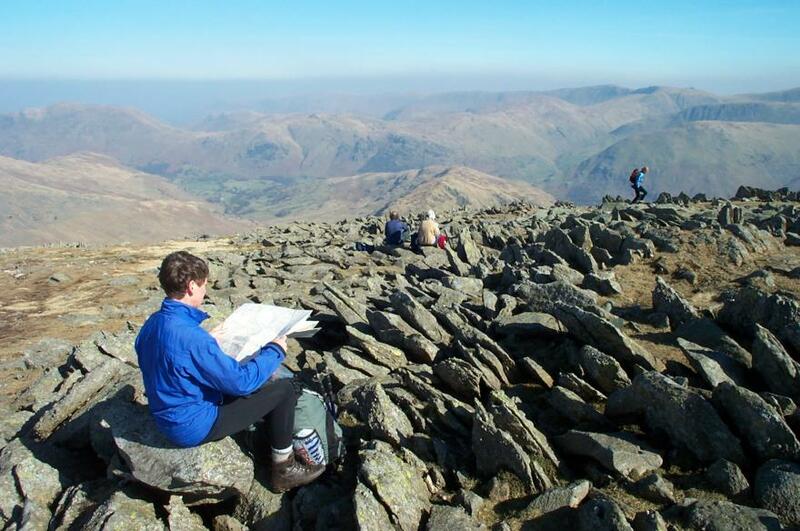 After much indecision we plumped for a walk that we found in a Trail magazine that started at Brigdend near Patterdale. It started with a nice steady climb up the ridge known, curiously, as Hartsop above How. This is about half way up looking west. 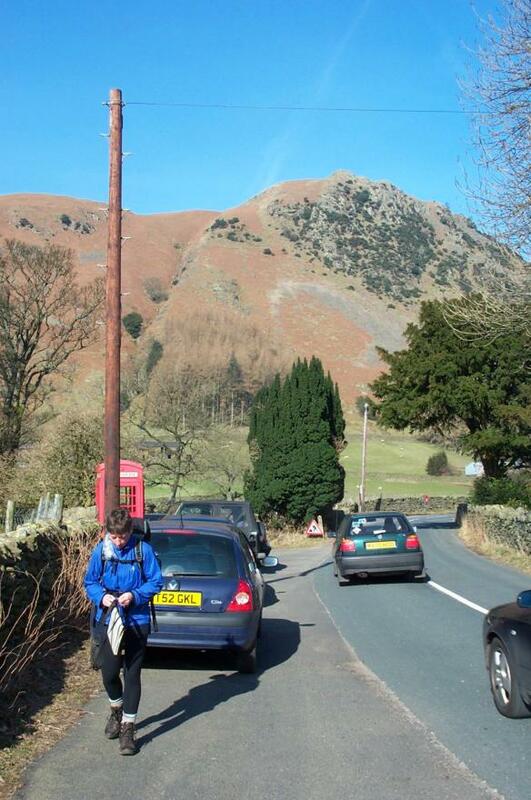 Left to right are Hart Crag, Fairfield and, above Anne's head, St Sunday Crag. We saw only one other person using this route up. 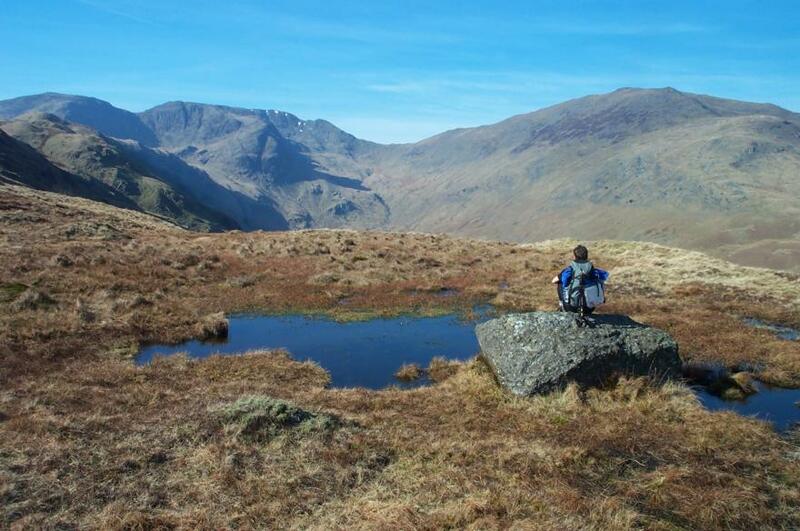 However, when we reached Hart Crag we joined the route of the Fairfield Horseshoe and were well on the beaten path. This is looking back east with High Street in the distance. Although there were no clouds, there was plenty of haze and we wondered if it used to get like this or it is a visible effect of modern pollution. 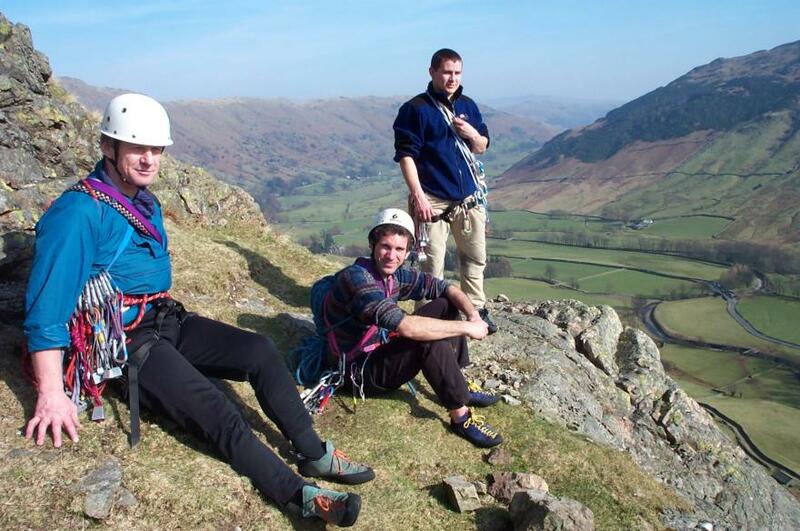 Then we headed south and dropped down to Little Hart Crag where we had lunch. 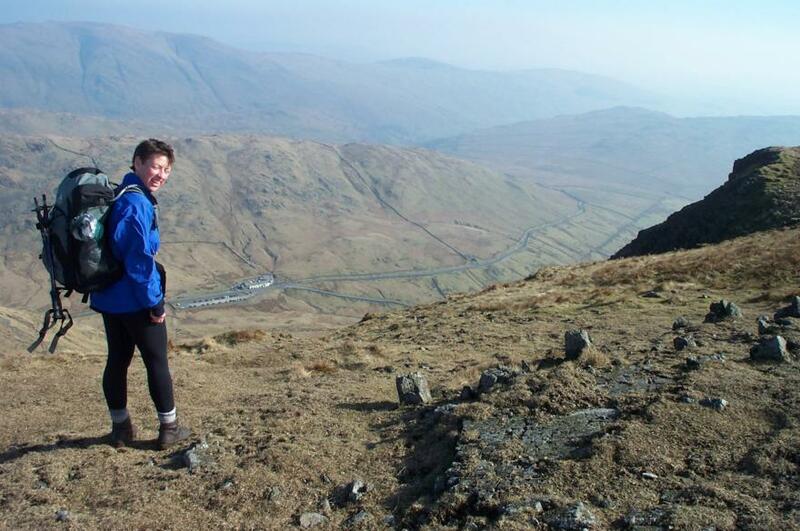 Then it was a slog back up again to Red Screes where we could look down onto the Kirkstone Pass Inn. We returned to Bridgend via Middle Dodd and a rather steep descent. Trail claims there is a path but we never saw one. On to the hotel where everyone was assembling in their glad-rags. 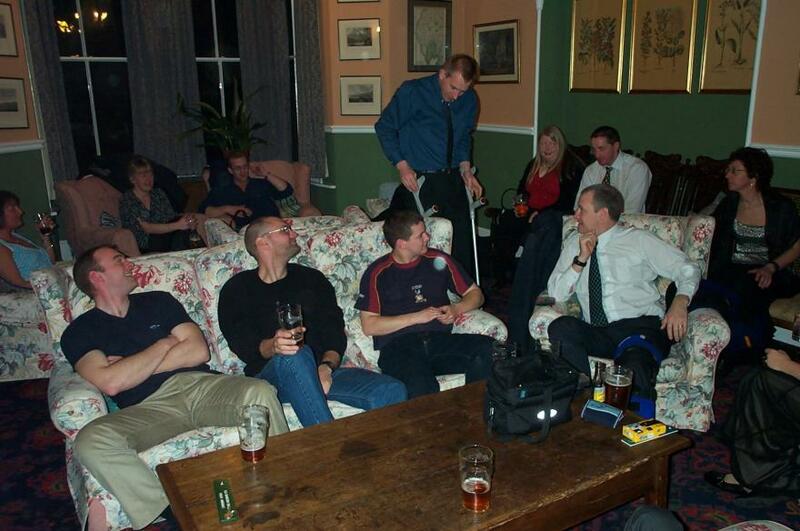 Chris had done something serious to his knee while skiing so Steve tempted fate by having a go with his crutches. Dinner was excellent. Some had to wait a while for the main course but it was all served piping hot. Rarely do you find mass catering done as well as this. 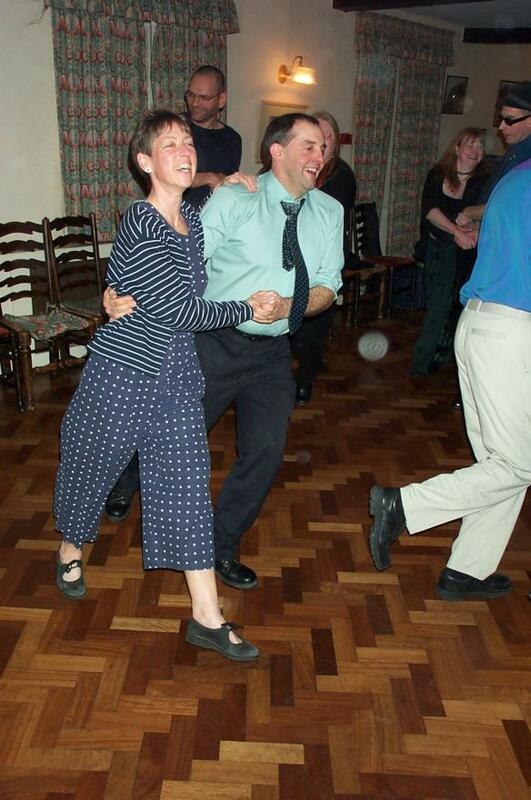 Then we all adjourned to the lounge for coffee while the dining room was changed into a dance hall and the entertainment prepared. 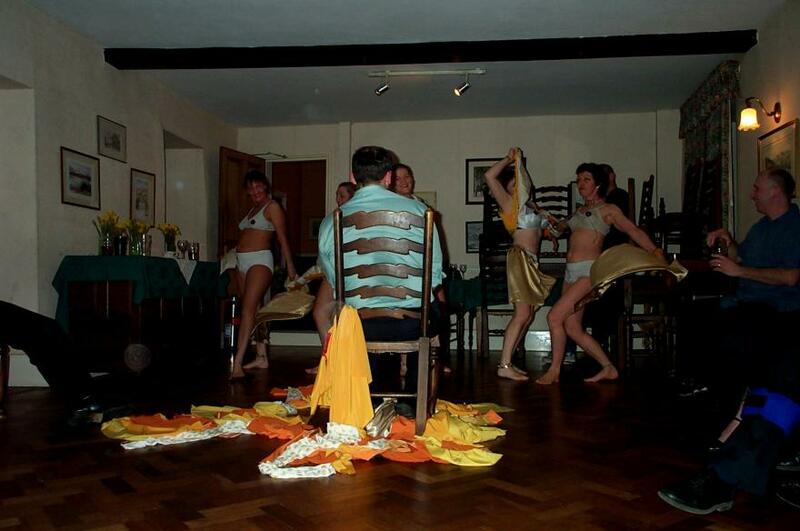 Several women took turns at distracting the birthday-boy while the arrangements were made. 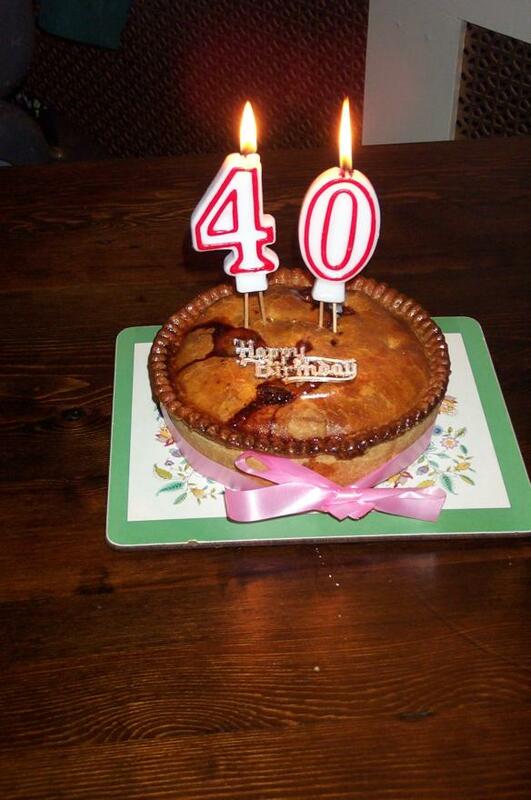 Dave's father was a butcher so he favours pies more than cake. The club gave him a variety of presents wrapped ever so tastefully. 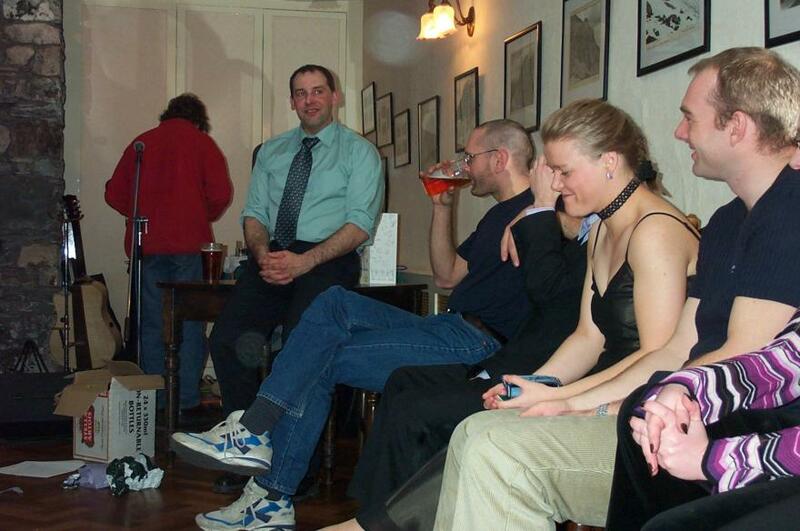 Then the entertainment began. 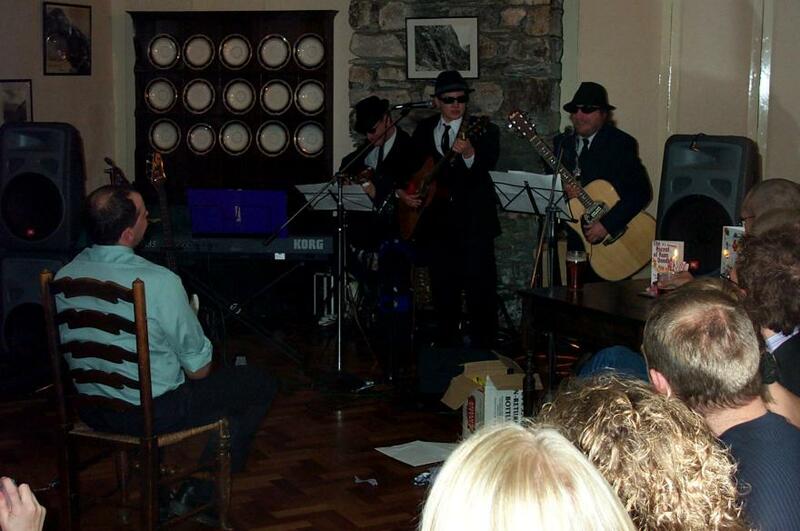 At great expense, all the way from Chicago, we had the Blues Brothers with some specially penned numbers. 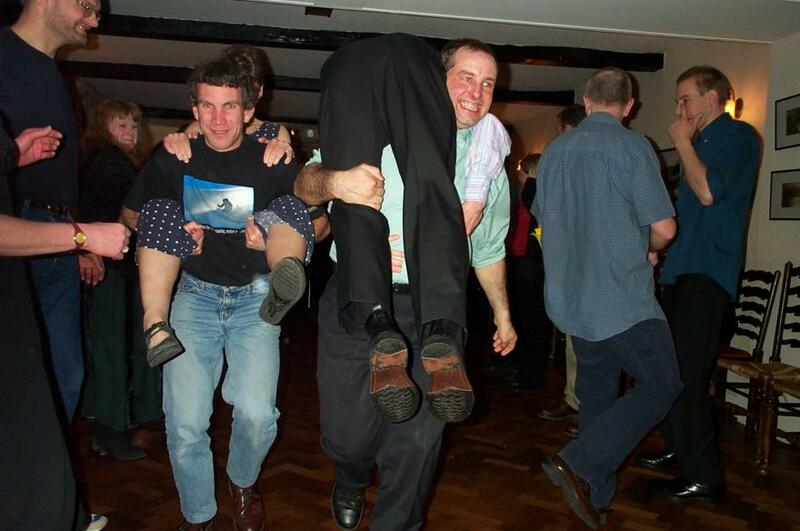 At his own expense, Dave hired the services of the local ceilidh band - and very good they were too. 'Top 2 couples get to the bottom of the set' - by any means. 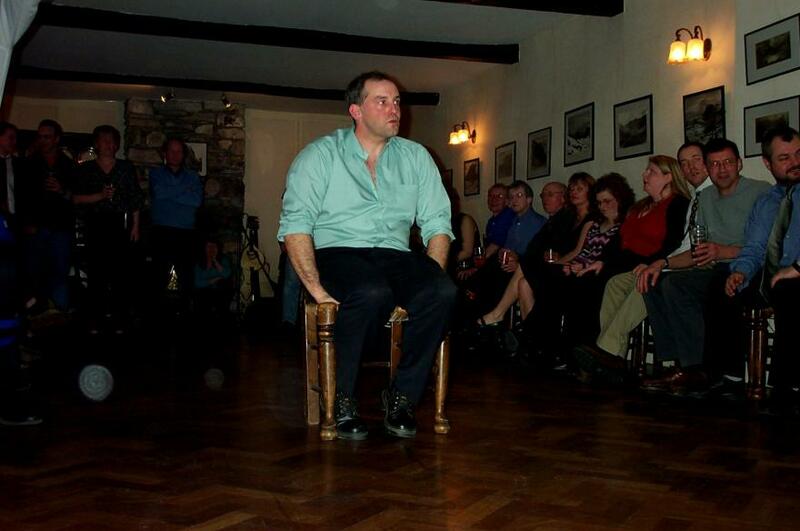 Dave waits pensively wondering what other treats there are in store for him - and why he has to sit on his hands! 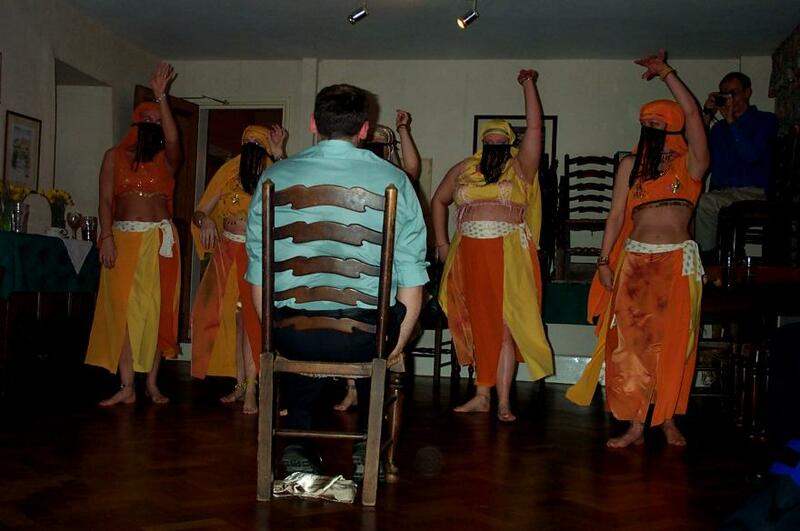 All is revealed - slowly - in the dance of the seven veils as performed by some local talent. Sunday dawned none too early and it was gone 10 o'clock by the time we had all assembled and set off on our various ways. 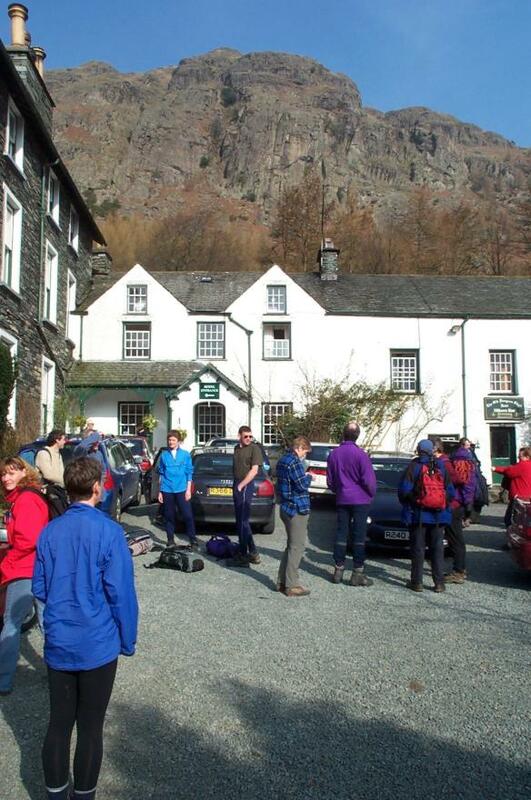 Three of us headed for Raven Crag which is just behind the hotel. As we were about to start, Peter appeared. 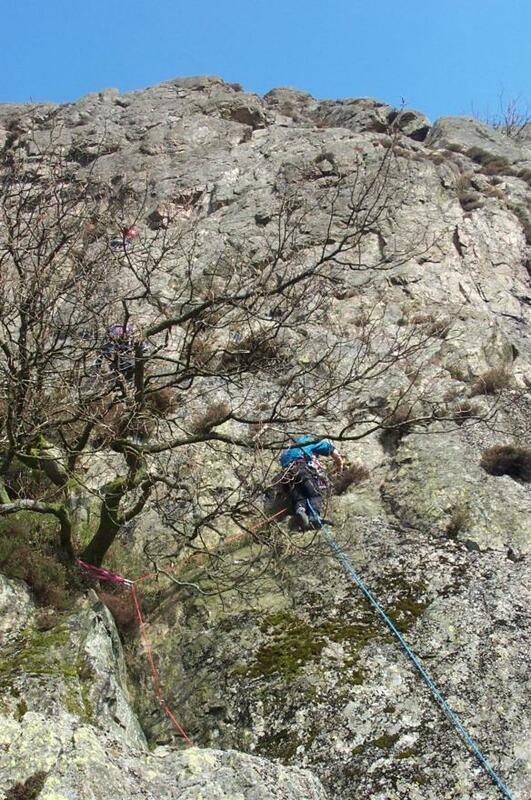 So we re-sorted ourselves and headed up Oak Tree Wall as two pairs. 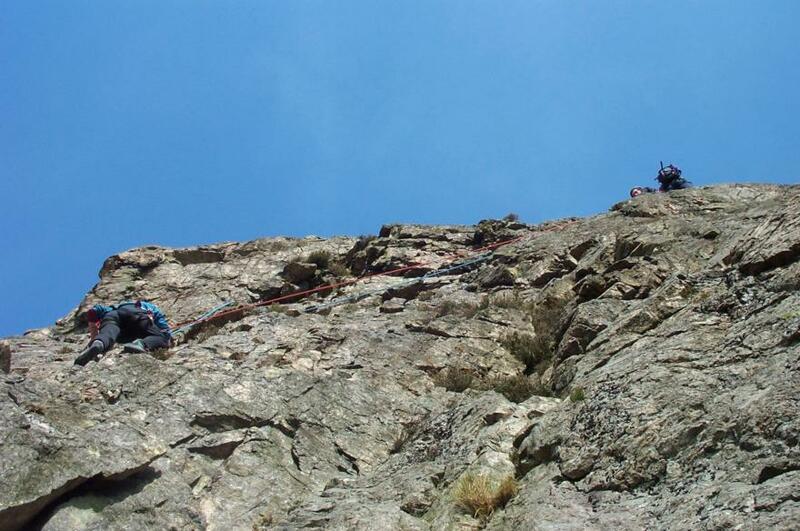 The climber in the background is waiting to start the rather busy Ordinary Route. Oak Tree Wall obviously has much less traffic and is quite green at the start. This is John's second attempt - having slid unceremoniously back down on his first. From the oak tree, the route steps right then up to a ledge where it joins Ordinary Route. This proved to be a bottle-neck. Not only did we have to wait for everyone on Ordinary but also a couple on another route coming in from the left. 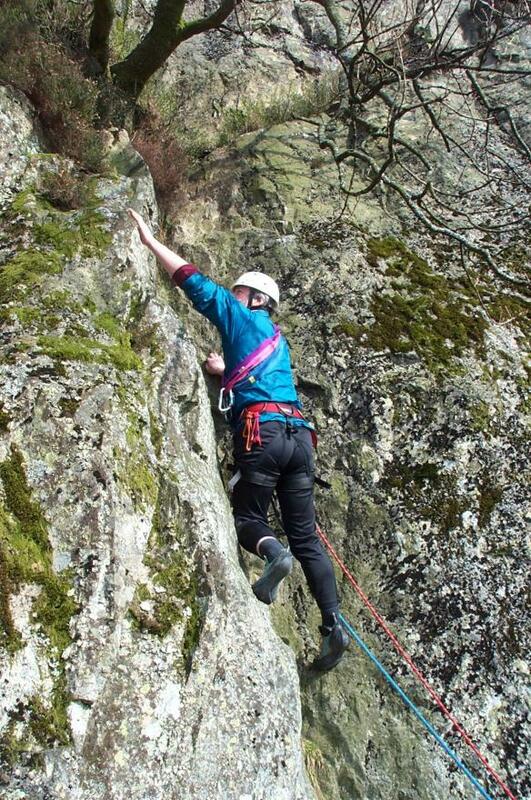 They started after us but sneakily skipped the first belay. The second pitch had quite a nasty traverse along an exposed and off balance ledge. I nearly balked and wasn't very proud of my style. And this is a mild severe? 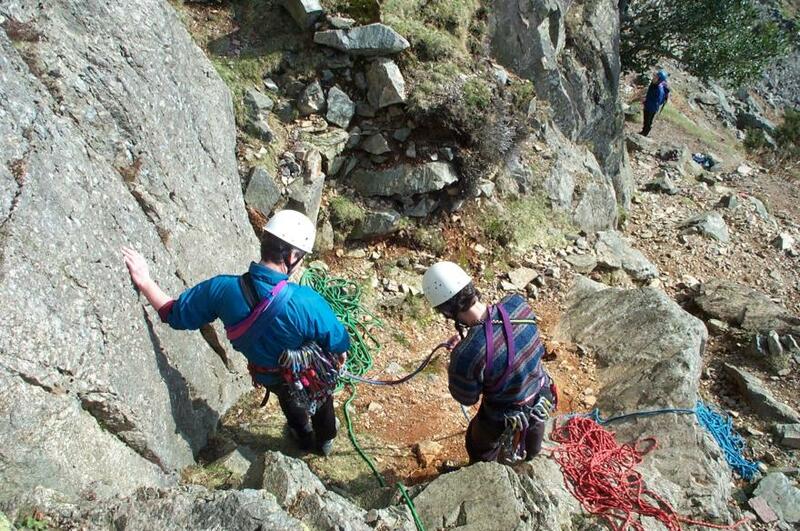 Pitch 3 was relatively easy and we were soon at the top. However, because of the traffic, it was already gone 2 o'clock so we decided to call it a day and head back to the hotel.